Two pictures worth a thousand words. 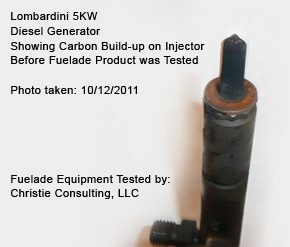 Fuelade reduces carbon build-up on injectors. This photographic side-by-side comparison of the same injector taken a few days apart tells the story. An exciting Fuelade story is expected to break soon. Check back with us often and learn more! 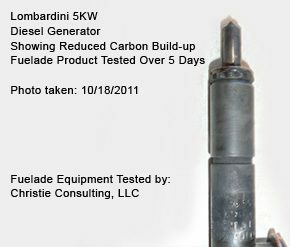 The use of Fuelade shows that dramatic diesel fuel savings and emissions reductions can be achieved. Fuelade is no ordinary fuel additive. It is a totally non-hazardous green technology. With normal use, Fuelade clients experience positive return on investment as the savings on fuel consumption far surpass the cost of the product. At current fuel prices, breakeven is below 3% fuel savings. Unlike typical fuel additives, the Fuelade catalyst is completely organic and safe for handling. It is non-caustic, safe for human handling and will not damage engines. The Energy Information Administration expects demand for fuel to accelerate over the next several years. Increased demand usually means increases in prices, so it's prudent for fuel consumers to seek out alternatives to reduce this dependency and to keep their fuel expenditures as low as possible. Fuelade addresses both issues effectively. © 2019 Fuelade Solutions. All rights reserved, Fuelade Solutions LLC.